A. Smith Bowman Distillery is one of the many whiskey sub holdings of the Sazerac/Buffalo Trace brands. It tends to specialize in small batch distillations, including the triple-distilled Bowman Brothers, John J. Bowman Single Barrel, and Abraham Bowman Limited Edition. They also offer small batch rum, vodka, and gin. Today we’re focusing on the Bowman Brothers. John, Abraham, Joseph and Isaac Bowman were Virginia militia officers in the American Revolutionary War. In 1779, they led thirty pioneer families to Madison County, Kentucky and established Bowman’s Station. Later, the brothers helped establish and settle Fayette County. They were legends, admired and respected by fellow settlers for their courage and bravery. 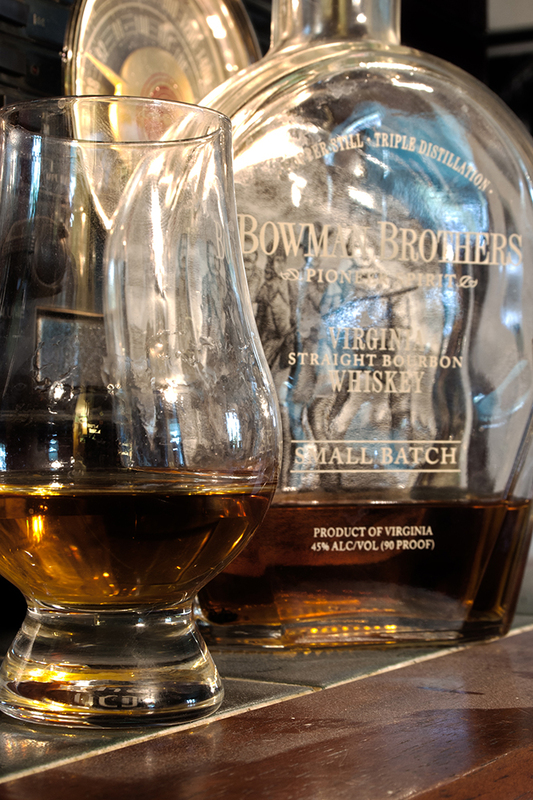 This hand-crafted bourbon whiskey is a tribute to these four heroic Bowman Brothers. Nose: Very bright, pleasant scent. Not as sweet-smelling as some bourbons, which isn’t a bad thing. Vanilla on the end. No harsh grain liquor scents. Neat: Dry and spicy on the front. Notes of vanilla and oak come up on the back. Not a beginners bourbon, but not one that’s overtly complex. The higher-proof comes through. On the Rocks: The sweetness becomes much more pronounced with the addition of ice (or water if that’s more your speed). The oak is more distinct as well. The ice adds some depth that isn’t present when presented neat. Verdict: This is one of the better bourbons we’ve had the pleasure of sampling here at Cocktails, 365. It’s not going to move heaven and earth for you, and at roughly $30 it’s not going to be your go-to bourbon for large crowds. However, you can do a lot worse at $30 a bottle. After mixing it as well, that higher proof and unique flavors stand up well and announce their presence even in the most complex of libations. Аppreciate thіs post. Let mе try it out.